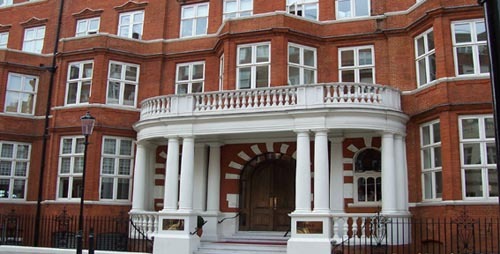 ‘1 Hans Crescent’ is an impressive former Court House adjacent to Harrods in Knightsbridge, London SW1. Eight years ago, a bespoke conversion created 34 ‘ high-spec’ private apartments, positioned over 6 levels. Although the property had an existing air conditioning system, it was now obsolete and as such, required replacing. The building was occupied whilst the works were being carried out, without any disruption to the occupants. The engineering required to meet the specific design criteria was complex. All the new air conditioning fan coils within the apartments had to be sized for duty on Low Fan Speed and meet strict noise constraints of NR25 to living areas and NR20 to bedrooms. 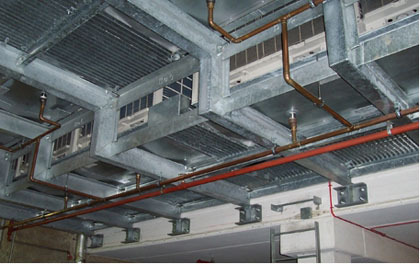 The fan coil units had to be ceiling void mounted, with ducted air supplies to be-spoke grille arrangements. 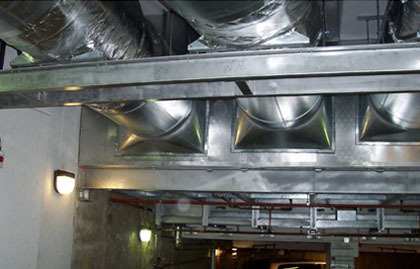 This included specialist attenuation units which were designed and incorporated within the ducted work arrangement. The VRV main condensing plant was larger than normal due to the required 'low fan speed to duty' ratio with limited diversity applicable to the overall design. This resulted in the need for a larger plant location area. Following numerous feasibility studies, it was finally agreed to relocate the main VRV plant to a new purpose-built two tier fully galvanised steel gantry structure, located internally and above the basement car park exit ramp. ACE Systems also under took the design, manufacture and construction of this be-spoke plant gantry. This created further complications in providing an adequate volume of ventilation air required for cooling. This problem was overcome by designing a forced air ventilation system which would be capable of delivering the required cooling air to the main VRV plant as located on the new gantry. 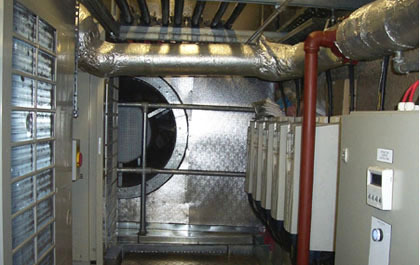 This solution was further complicated by the requirement to meet strict noise criteria and air discharge velocities, for the fan design and selection. 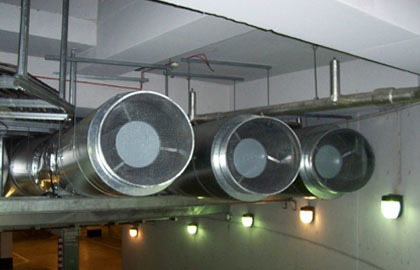 Be-spoke attenuation units were designed and installed to the fan inlets and exhausts; velocity restrictions were overcome by selecting larger capacity fans operating at greatly reduced duties. Inverter speed control systems were also incorporated into the design of the ventilation fans, to automatically increase or decrease their speed - dependent upon the temperature of the VRV discharge air. Incorporated within the overall design of the VRV plant and steel gantry arrangement, was the provision of an automatic electronic fire / smoke detection system and automatic water fire suppression system. The project was completed within the program time frame work of 18 months. The value of the works was £1.5 million. View looking at the front section of the VRV steel gantry platform with the 3 number forced air ventilation systems extracting through the wall of the plant area. The fans are also located to their own independent RSJ steel framework which spans the exit ramp.